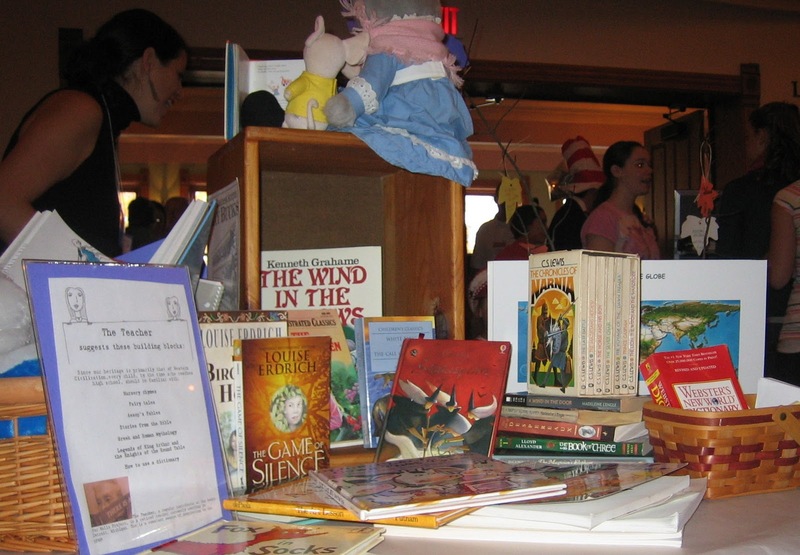 On Saturday Jerry Jenkins, Chairman and CEO of the Jenkins Group, asked The Mom how BFWP found out about the Traverse City Children's Book Festival. The Mom was happy to explain and to thank Interlochen Public Library Director Janette Grice for introducing us. Janette is always watching out for books and events that intrigue us. She had a feeling that we would be interested in TCCBF and once again, she was right. Janette gave us a flyer and suggested we contact festival coordinator Amy Shamroe and so began our relationship with TCCBF. We did a little research and found that the festival was free with all proceeds to be donated to the Grand Traverse Area Literacy Council. 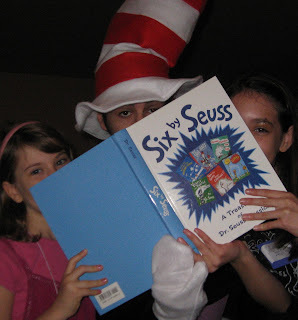 Mr. Jenkins explained in the TCCBF Press Release, “the Moonbeam Children’s Book Awards and our new Children’s Book Festival were both created to celebrate the role books play in enriching children’s lives." The Sisters agreed "TCCBF fits our mission and will be a great first experience sponsoring and participating in just such an event." We took a vote and unanimously decided to sponsor the festival. Then came our first discussion about financing. Just as we began to wonder if it would work a letter arrived from The Teacher. Her encouragement and very generous donation were just the votes of confidence we needed and we were on our way! Next came organizing and planning thankfully we had time, inspiration, and The Bean on our team. 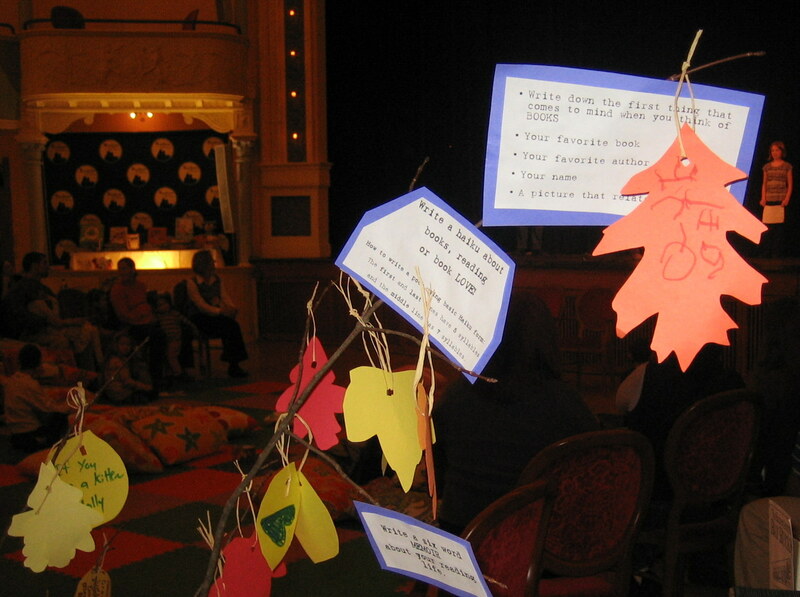 While it certainly was a lot of work, it was soul filling work and we maintained our inspiration beginning to end. The Big Sister made an official announcement just as the festival began, "Everyone! We never could have done all of this without all the help from our amazing supporters." 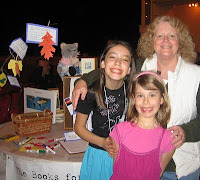 There was a resounding cheer, a happy tear or two, and then our work at Traverse City Children's Book Festival began. 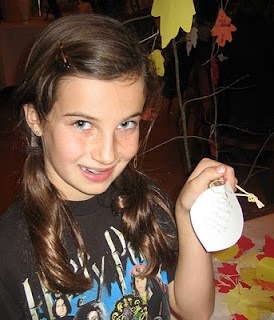 The Bean's bookmarks were a HUGE hit, with her original photography and quotes straight from the project. Watch for them, not only will they keep your page, they will keep you inspired! Since this was the very first festival, we had no idea of how many folks would attend, but we were ready for 200 or more... as it turns out there were more than 1,000! The Bean and The Sisters took our display very seriously; please notice that Gramma Kitty is reading a 'Toot and Puddle Book' to Toot and Puddle. Thanks to Britten Banners for our very professional banner. 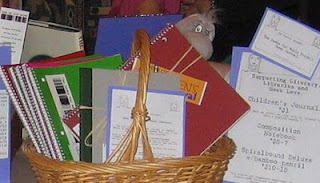 The Books! Each of us shared our favorite books and secrets to becoming a happy reader. Shhhh... one of the secrets is creating a cozy reading space, which we did: a couch, blanket, cookies, baskets of books and a dictionary. So tired festival participants could take a reading break... many were seen relaxing and enjoying books and a cookie or two. 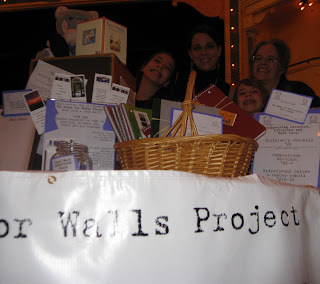 Announcing BFWP Book Journals complete with instructions developed by The Four of Us. We had three options available including 25 that The Sisters made just for kids. 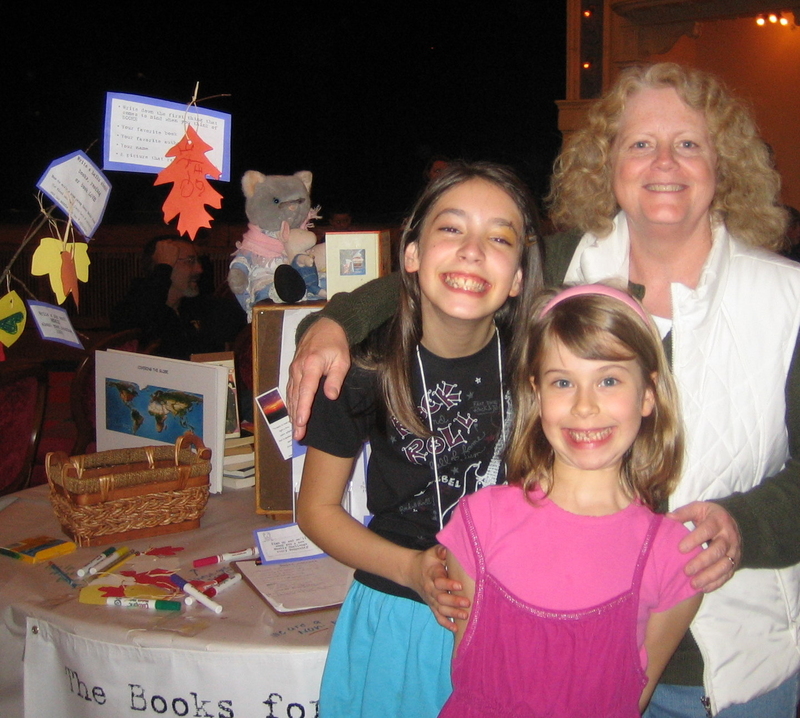 The good news: we sold out of the kid's journals and raised all the money needed to sponsor the festival, The Sisters were proud! Coming Soon: BFWP Journals available for sale here. Write a Haiku about a book or book love. Write a Six Word Memoir about your reading life. the Six Word Memoir Challenge... Great Job! 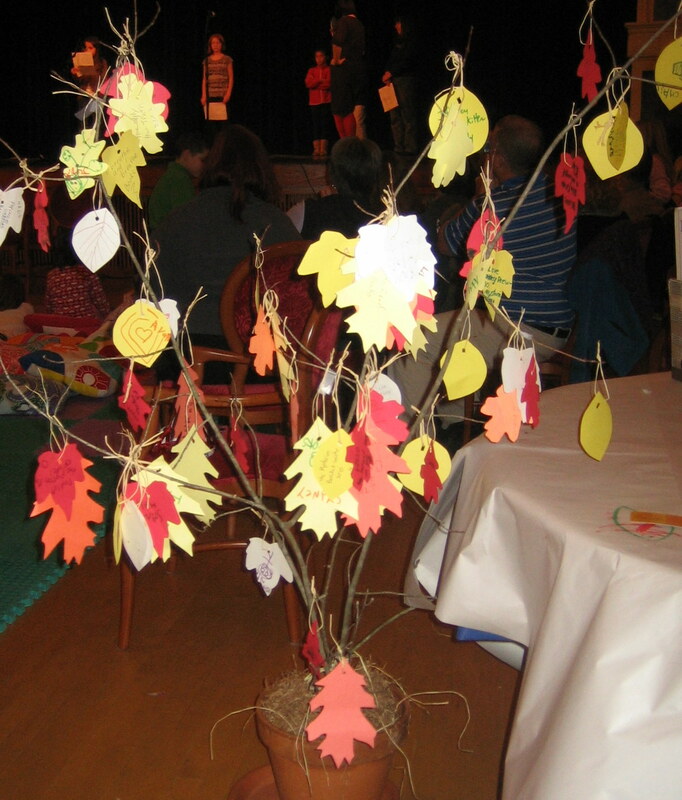 We cut out dozens and dozens of leaves and we used every single one. 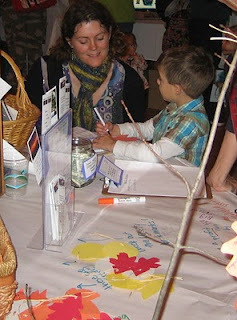 The Dreamer, Jenn Ryan, helping her nephew Jack with his leaf. ever grateful for her smile and participation at BFWP. shared her favorite book: The Missing Piece. Our table was well staffed and so each of us was able to sneak away and enjoy the entertainment, browse books and meet authors, illustrators and the wonderful vendors. We did some Christmas dreaming at Hazelnut Kids, we are longtime fans of their amazing toys. 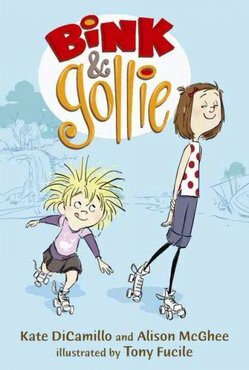 The Sisters invested in their own copy of Bink and Gollie, Kate DiCamillo's latest, at the Brilliant Books. Brilliant Books is independently owned by Peter Makin who asked The Mom a good question: "why Books for Walls?" The Mom loves any opportunity to share the story, it is a good story (read all about it here. Or watch our short intro video.) Peter's question and our wonderful conversation prompted The Mom to ask The Poet for more stories about the original 'Books for Walls' and thankfully he agreed, more on Max coming soon! We could go on and on, but instead we will leave you with this from The Bean, "a love of reading aura saturated the scene at the Opera House. 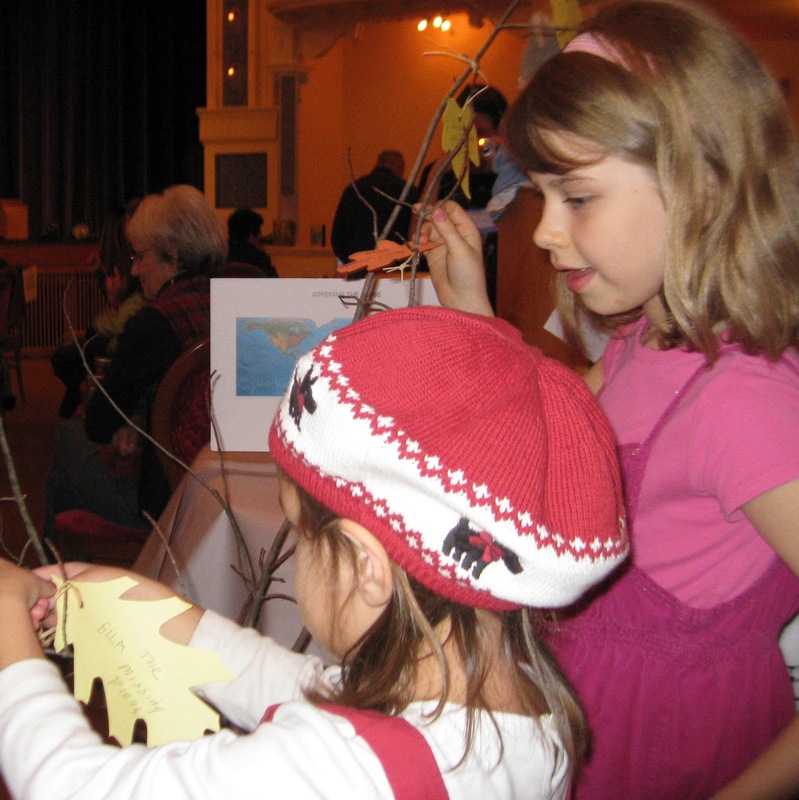 It was a joy to behold as young and old joined in honoring the wonders of the ages-old pursuit of learning!" Thanks Bean, we couldn't have said it better. in particular "The First Snow in the Woods." *wonderful*!! 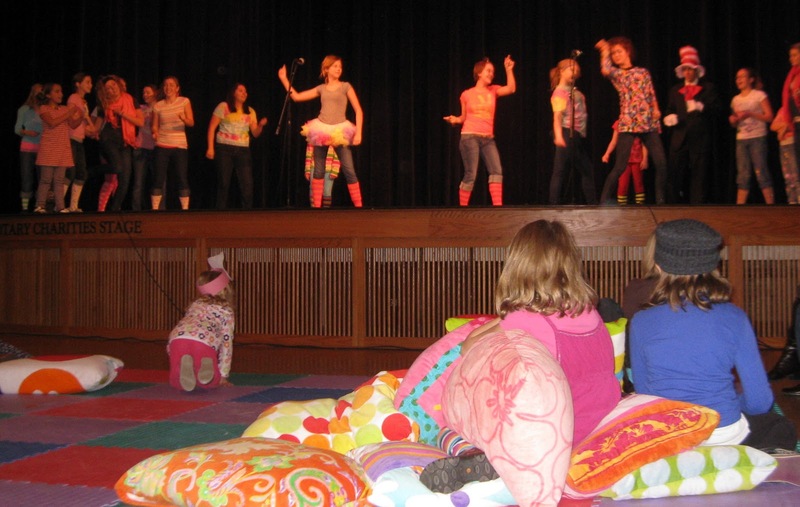 it is events like this that shape a community, shape lives, create joy. wish i'd been there - but your photos and stories are the next best thing! Wonderful indeed. 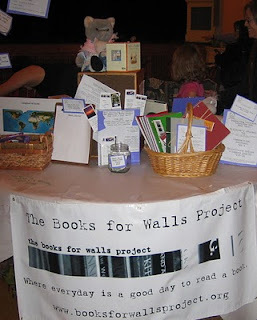 It is events like the TCCBF and inspired projects such as Books for Walls that bring the joy of reading to children. Thank you for the shout out for Brilliant Books. We try to do our part. We're looking forward to your visit.